Scoopy Doo pooper scoopers are a pet waste removal business servicing Oakland, Genesee and Macomb Counties in Michigan since 1998. Our type of service was initially known as Professional Pooper Scoopers and since has been called: Dog Waste Removal Service, Pet Waste Removal Service, Dog Poop Pick up Service and the list goes on. The fact is we pick up dog poop from residential and commercial properties, and any pet friendly areas. We are licensed and insured and offer the best profession pooper scooper services at the most reasonable prices. Our services begin at only $9.50, and require no contract and payment is not due until service is rendered. Satisfaction Guaranteed. The service of Pet Waste Removal has grown due to the demand and awareness of pet owners in need of cleaning up of dog waste. 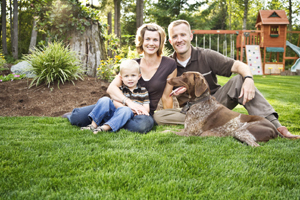 Pet waste removal service is now being considered part of your lawn maintenance and not a luxury but a necessity. There are many reasons people can not pick up there dog waste in a timely manner. There is the repugnant factor. Many dog owners have a extremely weak stomachs and truly can’t pick up their pet’s waste. Other pet owners have health issues or physical limitations. In today’s busy lifestyle, we find between work, home, school, kids, errands, and if anytime left over a social life, there is very little time or energy left in a day for this canine waste cleaning chore. For the cost of a fast food meal, a couple gourmet coffees, or a few movie rentals you could free yourself from one of your weekly chores. Having a Professional Pooper Scooper Waste Removal Service takes away the only unpleasant task of being a dog owner, the clean up of dog waste. Allow your self the freedom to enjoy your home, family and yard at a surprisingly low cost! Imagine NEVER PICKING UP YOUR DOGS WASTE AGAIN! !